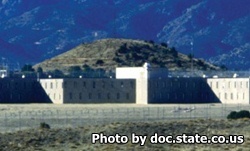 Centennial Correctional Facility is located in Canon City Colorado and is part of the East Canon Complex. The facility is made up of varying custody levels and can house up to 320 inmates. This correctional facility uses incentives to try and modify the behavior of offenders who are typically difficult to manage. This facility offers treatments and programs to eligible inmates. Offenders can take classes to obtain a basic adult education, and GED, and can seek treatment for drug and alcohol dependency. This facility also has a residential treatment program for offenders who are mentally ill.
All visitors must fill out a visitors application and be approved prior to visiting. This facility requires everyone schedule a visiting appointment to visit by calling (719)-269-5252. Level I offenders have visiting on Fridays 8:15am-9:45am, 10:30am-12pm, 1pm-2:30pm. They may have one non contact visit per month. Level II offenders have visiting on Fridays 8:15am-9:45am, 10:30am-12pm, 1pm-2:30pm. and Sundays 8:15am-9:45am. They may have two non contact visits per month. Level III offenders have visiting on Fridays, Saturdays and Sundays from 8:15am-9:45am, 10:30am-12pm, 1pm-2:30pm. Offenders at this level may have up to four non contact visits per month. Level IV offenders have visiting on Fridays, Saturdays and Sundays from 8:15am-9:45am, 10:30am-12pm, 1pm-2:30pm. Offenders at this level may have up to four non contact visits per month. Level V offenders have visiting on Fridays, Saturdays and Sundays from 8:15am-9:45am, 10:30am-12pm, 1pm-2:30pm. Inmates at this level may have up to four contact visits per month. Level VI offenders have visiting on Fridays, Saturdays and Sundays from 8:15am-9:45am, 10:30am-12pm, 1pm-2:30pm. Offenders at this level may have up to four contact visits per month. Level VII offenders have visiting on Fridays, Saturdays and Sundays from 8:15am-9:45am, 10:30am-12pm, 1pm-2:30pm. Inmates at this level may have up to six contact visits per month. Level VIII offenders have visiting on Fridays, Saturdays and Sundays from 8:15am-9:45am, 10:30am-12pm, 1pm-2:30pm. Inmates at this level may have up to eight contact visits per month.